October 1958 - Oh Boy! Vince Eager and Marty Wilde perform The Everly Brothers song "Bird Dog" together. Cliff Richard begins a 12-date tour with the Kalin Twins at the Victoria Hall, Hanley. This was the first time Cliff and the new Drifters (later known as the Shadows) performed live together. Cliff versus Marty row makes headline news. Marty Wilde’s agent Larry Parnes complains to Jack Good that Cliff Richard is getting the best songs to sing and receiving more publicity than Marty Wilde. He once again threatens to withdraw Marty from the series after the 18th October show. Jack Good suspected Parnes of being greedy, as his stable of stars already dominated the series. So Jack cheerfully released Marty who had wanted to remain, leaving Cliff solely as the main star attraction. Parnes was to quickly regret the decision but although a reconciliation was eventually reached between the two men, Marty was to remain off air for over three and a half months, not returning to “Oh Boy!” until 7th February 1959. The 'Oh Boy!' official LP was recorded before a specially invited audience on the evening of Sunday 19th October 1958 at the Abbey Road Studios, St. John's Wood, London. Cliff Richard and Peter Elliott were otherwise committed to live bookings on the 19th and recorded their tracks for the album at Abbey Road Studios on Tuesday 21st October. Cliff and The Drifters were appearing at the Colston Hall in Bristol…which was the final night of the Kalin Twins tour. 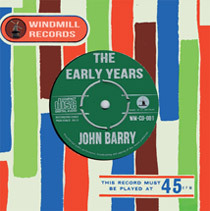 The LP was released on the UK Parlophone label: PMC 1072 in December 1958. "Oh Boy!" is a hit! It has been booked to continue until at least next March. And next week the show presents the first TV appearance of Tommy Steele for four months. Contracts are not yet signed, but Tommy has agreed to appear on the show next Saturday if he can fit in the date with his other commitments, which are not expected to provide dificulties. He had not planned any more television appearances this year, but agreed to do the show for Jack Good. Steele appeared in the early '6.5 Special' programme, which Good originated. They carried both singer and show to a peak wave of success. Good is also hoping to use an American singer in future "Oh Boy!" programmes. She is Edna McGriff, who was unknown here until the beginning of March, when her first records were released by the Gala low-price label. She has quickly established herself as the labels principal artist and Gala chief Monty Lewis is planning to bring her to Britain for TV and other dates. Exact time of her visit cannot be arranged as she has just had a baby. "I certainly hope to get her for "Oh Boy!" as soon as she can come over," Good told the NME. Both developments came at the same time as ABC-TV decided to extend the run of the programme. Due to end on December 6, the company has booked it for at least thirteen more weeks. It will continue to be seen on the entire ITV network at 6p.m. on Saturdays, but the producer has not yet had time to consider any possible cast changes for the extended period. Making a TV debut in tomorrow's show is Tony Scott's Cha-Cha Band, appearing with Don Lang, making his second showing on the programme. Cliff Richard returns tomorrow after his absence last week, when a conflict of dates meant he had to appear at a York concert instead. The surprise deputy was Terry Dene who rehearsed and appeared in the show within 24 hours of being asked. For the first time Cliff Richard and the new Drifters are given star billing and close the show. Audience response was so wild Good placed Cliff at the top of the bill for all of Cliff’s remaining 8 appearances until the end of the year. (1st, 8th, 15th, 22nd November and 6th, 13th, 20th and 27th December 1958). Ronnie Carroll, who left the series last week, begins a 6 week residency on the rival '6.5 Special' TV show on the BBC. He is replaced by balladeer Peter Elliott who is booked until the end of the year.